It's a brilliant fall morning in Yayladagi #1, a refugee camp on the grounds of a former tobacco processing factory in southern Turkey. We're just three miles from the Syrian border, and camp translator Jamal Akgol is showing us down the rows of waxed canvas tents constructed to house thousands of refugees fleeing the carnage at home. "Whatever they need, they have," Akgol said with some pride. "And they do not have to pay for anything." Yayladagi refugee camp in Turkey. Photos by Sebastian Rich for PBS NewsHour. Every tent boasts a TV satellite dish and an electricity hookup to power its lights, heater, refrigerator and cooktop. The old stucco tobacco warehouses now provide classrooms for the 1,000-plus children, a medical clinic, showers and laundry facility with washing machines. Street sweepers even patrol the walkways armed with dustbin and brush. 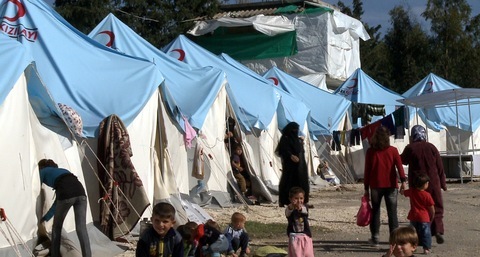 The Turks set up this camp in May 2011 for people fleeing the Syrian army's initial assaults on protestors against President Bashar al-Assad. It rapidly filled to its 2,400 capacity, the first wave in a flood of some 115,000 who've taken shelter in Turkey's government-run camps. "Neither they nor we know when they'll go back," Akgol said. "But there's nothing on the other side for them. Over there, they would die from attacks, or hunger." We saw the truth of that on Wednesday, at a makeshift camp for displaced people about three miles on the other side of the Syrian border, near the town of Atmeh in Idlib Province. Hastily constructed just two months ago by a young Aleppo man who calls himself Farouk, it rapidly filled with 3,000 people who'd been driven from home by the regime's latest campaign of aerial bombardment in areas held by the rebel Free Syrian Army. "We escaped at first light one morning, before the bombing started again," said Khadejah Al Darwish, who arrived with her husband and 11 children. "We wanted to go to Turkey, but they won't let us in now." With the help of foreign donors, Farouk bought 300 tents with sturdy foundations and tarps, and foam mattresses for beds. But that initial bequest was spent, and Farouk said his Qah Camp depends almost entirely on a steady but insufficient stream of money from IHH, a Turkish nongovernmental organization. Camp residents must subsist on half-rations of prepared meals. There are no blankets unless the residents carried them in, no lights or heaters inside the tents, and there are just 12 bathrooms for all 3,000 people. As we walked through the camp, Farouk was besieged with entreaties from distressed residents. "That father just told me it gets to zero degrees at night, and he has nothing to keep his children warm," Farouk said. "We want to help these people more, but there is not enough money." The contrast between these two camps is a vivid example of why Syria's neighbors -- Turkey, Jordan and Lebanon -- have been swamped with refugees from the 20-month-old Syrian conflict -- some 400,000, the U.N. estimated this week. And that's just in the registered camps. There are countless tens of thousands of others who've entered neighboring countries to take up residence in Turkish, Jordanian and Lebanese cities. Turkey's total soared past what officials had called its "psychological limit" of 100,000 several weeks ago. While it's building more camps, Turkey's border guards are now blocking entry to Syrians without passports. And that's most poor Syrians. No matter where they've found shelter, the displaced Syrians we talked to share one feeling -- a desperate desire to return home. talks to Margaret Warner (on right). "My husband was a teacher, we had a normal life," Darwish said, sitting in her tent in Camp Haq surrounded by nine of her children. "I want my family to have that again." Forty miles to the south, in Camp Yayladagi, 24-year-old Amani Kanibo whiles away the time by making pro-revolutionary artwork out of painted seeds, grains and wood. 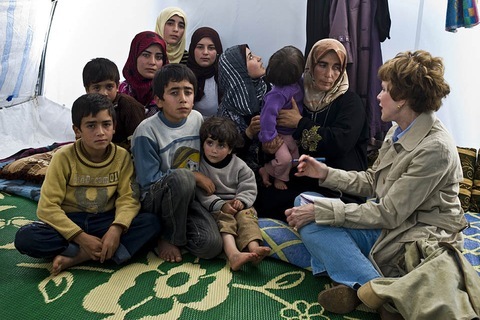 She held her 6-year-old son Hassan close, saying, "I want my children to go back to their land. They are losing their future here." Those displaced by the Syrian conflict also seem to share another sentiment -- that they'll need international intervention to achieve their dream. Said Darwish: "We need the rest of the world to help us get rid of Bashar al-Assad, so we can get home." But given the continuing disagreement among the U.S., its European allies, Russia, China and Syria's neighbors about what to do, Darwish and Kanibo may have a long time to wait.